The “HiTemp” THT™ Series hose, features a wire reinforced helix which provides strength and allows for use at higher temperatures without risk of hose deformation. Wire can be grounded for additional static dissipation. Also is constructed with a static dissipative tube to help prevent the build-up of static electricity for added safety and to help keep material flowing smoothly. 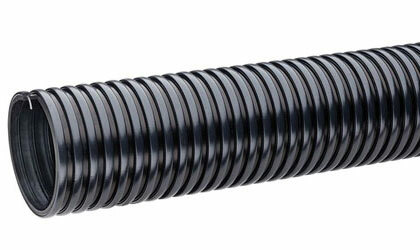 Use of “Cold-Flex” materials enables hose to remain flexible in sub-zero temperatures. The convoluted cover design provides increased hose flexibility. Click here for more info.